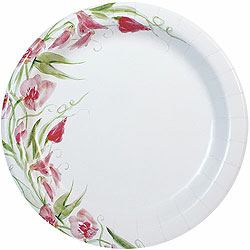 10.25" Everyday Red Floral Dinner Paper Plates 24 ct.
7" Everyday Red Floral Salad / Dessert Paper Plates 48 ct.
20oz. Everyday Red Floral Paper Soup Bowls 24 ct. Everyday Red Floral Paper Luncheon Napkins 2-Ply 40 ct.
12oz. Everyday Red Floral Paper Cups 24 ct.